Before you cross the street, remember to first look up from your phone. Before you cross the street, you need to remember to first look up from your phone. 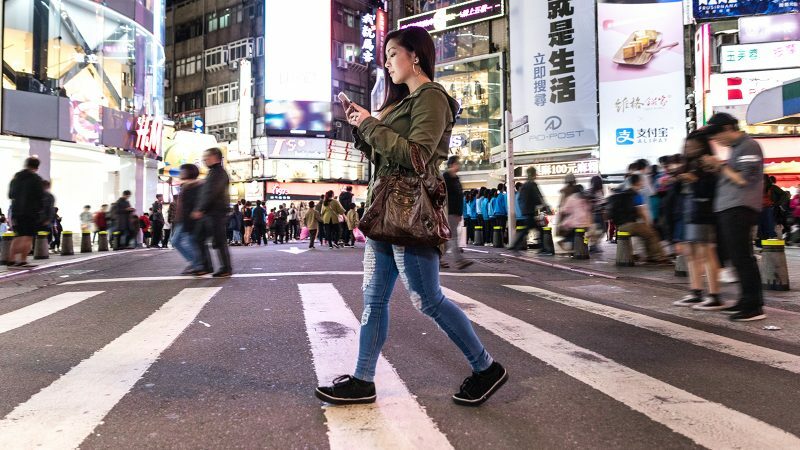 We are taught to watch out for distracted drivers when walking, but a new report is asking us to be more mindful of our own addictively distracting devices. This year’s Governors Highway Safety Association report found that the number of pedestrians killed by cars is rising, and our smartphone use could be a cause. The GHSA report found that the number of pedestrians killed in motor vehicle crashes nationwide in 2017 was 5,984 — a total that has stayed the same for the second straight year. While other traffic deaths have fallen, pedestrians being fatally struck by cars is still on the rise. The number of pedestrian fatalities has increased by 27% from 2007 to 2016, while all other traffic deaths decreased by 14%. Alarmingly, pedestrian deaths now make up a larger proportion of traffic fatalities than they have at any time over past 33 years. More than two-thirds of these deaths are occurring in the night when drivers do not clearly see pedestrians. What’s causing this spike? The GHSA has no clear answers, but it suspects that an increase in marijuana use and smartphone distraction could be factors. In D.C. and the seven states that have legalized marijuana, pedestrian fatalities rose by 16.4%, while in other states that number decreased by 5.8%. “More recent factors contributing to the increase in pedestrian fatalities might include … the increasing use of smartphones, which can be a significant source of distraction regardless of travel mode,” the report states. The number of cellphone-related, emergency department visits has risen in parallel with cell phone use in the United States, according to the GHSA report. In many of those ER visits, the cause was the person being distracted while texting on their phone. If you are not going to be mindful of texting while walking, the government may be mindful on your behalf. Recognizing that we are not going to regulate our distraction, the city of Montclair, California, has banned looking at your phone while crossing streets. In Honolulu, a city known for its high number of pedestrian deaths, you can get fined for crossing the street while looking at your phone. Bottom-line: When you are looking at your phone, you are not looking at your surroundings. You are more likely to jaywalk or cross the street without looking both ways. And for too many of us, that distracted choice proves fatal.